I am actually more than 1/2 way through the KD review. The ski is really very interesting. I think I know how the review is going to read. I just need to get my thoughts in order. For now all I want to say is that I ran up the line once in practice once on friday and ran 38. In the tournament I ran 4 @ 38 one round and 2 @ 39 the other round. If you look up my scores you will see that is about as good as I can ski. Always love the reviews . . . and I suspect that Horton is a better skier than he gets credit for! Man....my first real high end ski was the KD 7000 Carbon. I loved that ski when I got it. I still have it but it is in "unrideable" shape after I was done putting handle pops in it and trying to repair it. I am intrigued with their entry back into the US market. Interested in reading more ... I ran Kidder and KD skis until I made the switch to Iconn and then Connelly and then finally to Syndicate, I did take notice that the top sheet looks identical to the 2005 ski of the same name. This ski is really good. It is not sensitive to setup, in that you can ride it with any settings, but it works much better when you get it dialed in correctly. I have watched Horton ski for over 30 years and he has not looked better on any other ski. As soon as the bindings and fin were in the right place, he ran 38. The third ride he skied to (or close to) a tournament PB in a class L.
@Dirt sounds like it needs to get on your borrow from @Horton list. I hate to admit this publicly, but @Horton did look good on the water this weekend. Almost like a big dawg!!!! Agreed with @skidawg I watched him run 2 at 39 when I was boat judge, definitely one of the better 38s I have seen him run in a tourney! Loaning a ski to @Dirt is a lot like loaning a hotdog to a Labrador. You will likely get it back and its shape will be similar but it will smell really bad and attract flies. How does one get their mitts on one?? @gavski Talk to @twhisper he'll get you set up!! Dude almost ran 38 on the Katana, I'd say katana is the way to go. @matthewbrown yeah it's amazing. If I can run 38 behind you the ski must be really really good. 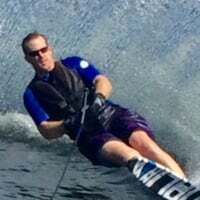 I skied great last weekend in Sac ( 2 @ 39 ) and when I got home the temp dropped 20 degrees. So this video is not my best skiing on the KD but it shows that the ski still works when I am cold and stiff. Unless I am mistaken that was a very nice looking 38. Your offside looks killer. Yes the offside on that ski is Bulletproof. When I do it right the onside is also really snappy. Back on the reflex fb also that ski looks good !! I must be color blind now also. Still looked good. @Horton - how's the review coming along? Were you running stock numbers? Soo I was done with this review. The text was ready for final edit and the pictures were taken. Then @twhisper sent me some very different settings. Crap! I had to try them. Yesterday was the second time I skied with those settings and it was in a tournament. After painting my lake house all morning, I went over to the tournament and ran 5 @ 38. This is not a PB but anything greater than 4 @ 38 is great for me. Considering my lack of focus ( and sleep ), I would say it says a lot about the ski. The review will be edited and out in a day or so. @Horton looks best in makeup!